The Oxford Senior Center is open to anyone sixty years and older, living within the Oxford township, who would like to get out and have a delicious hot meal, in the company of others, in a warm and friendly atmosphere. 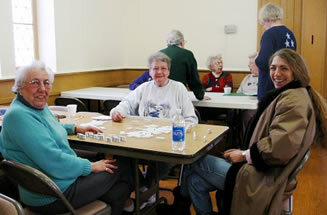 The Center is a gathering place for anyone who would like to get out of the house, get together with other seniors to have lunch, socialize, share memories, play cards or dominoes, or bring/start another game. Mondays it’s B.Y.O.L. (Bring Your Own Lunch), held at the United Methodist Church. A catered lunch is served on Wednesdays & Fridays at St. Paul’s Church Parish Hall. Come check out the Senior Center! Hours: 11:00 am until 2:00 pm. Meeting Locations: The Center offers this wonderful program every Monday, Wednesday, and Friday. On Mondays, the center is held at the United Methodist Church, without meals. 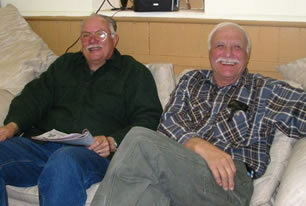 Seniors are invited to bring their own lunches, and enjoy the company of others in a friendly atmosphere. On Wednesdays and Fridays, they're at St. Paul's Church Parish Hall, for serving food. Nutritious and delicious lunches are served, prepared by the Area Agency on Aging (AAOA). Caterer: The AAOA's Nutrition Program acts as a caterer. Delicious meals are prepared for all the centers each day in Norwich. The AAOA handles eight Senior Centers in the County, as well as life lines; home meals; and personal care, like housekeepers. In a nutshell, Oxford is not one of their Centers due to budget cuts and minimum response numbers, but they do provide the meals. As a caterer, the AAOA Nutrition Program charges full price for their meals, which are delivered to the Center in St. Paul's Church Parish Hall by the First Transit bus. Charlie McMullen runs the St. Paul's "Taste N See" Soup Kitchen, which serves the community every Monday night at 5:30 PM. He had established and licensed the facility, St. Paul's Church Parish Hall, for serving food. Through Charlie's management and fellowship, Jeanne Walsh is able to use the same kitchen for serving seniors on Wednesdays and Fridays. Menu: The AAOA's Nutrition Program makes hot, healthy lunches such as, Fish Kiev, with Parsley Potatoes, Harvard Beets, and Fresh Fruit under the direction of Trudy Harris-Irons, the Nutrition Coordinator. Seniors are provided a printed monthly menu, in advance, in the Bullthistle Bulletin, a small newspaper published by the Agency, which is distributed throughout the centers. The menu is also online as a printable PDF document at http://www.co.chenango.ny.us/AAOA/SrCenters.htm - just click on the word "Menu", then print. Cost: All clients are asked to contribute financially to this program by way of donations. The scale is based on your ability to pay by the "envelope system". (A $3 donation is suggested) The Senior Center is supported by the Oxford Town Board combined with financial aid from generous contributions from the community's service organizations. Contributions are accepted and handled by Pam Robb, who volunteers as the Center's bookkeeper. Activities: Seniors are invited to come and enjoy a great lunch, get together and socialize, share memories, play cards or dominoes. Approximately 15 to 22 men and women attend. If you're new to the area, stop in, and they'll introduce you to some very friendly people. Volunteers such as demonstrators/lecturers in health, financial, fitness, education, or arts are welcome to contact Jeanne Walsh to schedule an appearance. Reservations: It is helpful to make reservations a day ahead whenever possible. Call: Jeanne Walsh--607) 334-7947 or Pam Robb--(607) 843-7105. The Senior Center is not for people that can’t afford meals, although you could eat for free. It’s not for “old” people. The people that come are still active, no matter what their actual age. “What it is mostly for is socialization. For health and well being, all people need to reach out and be a part of the social community”, stated Debra Sanderson, Director of the Chenango County Area Agency on Aging (AAOA). The Center welcomes all seniors who stop by with warm conversation and a pot of freshly brewed coffee, so come on in and check out the senior center!